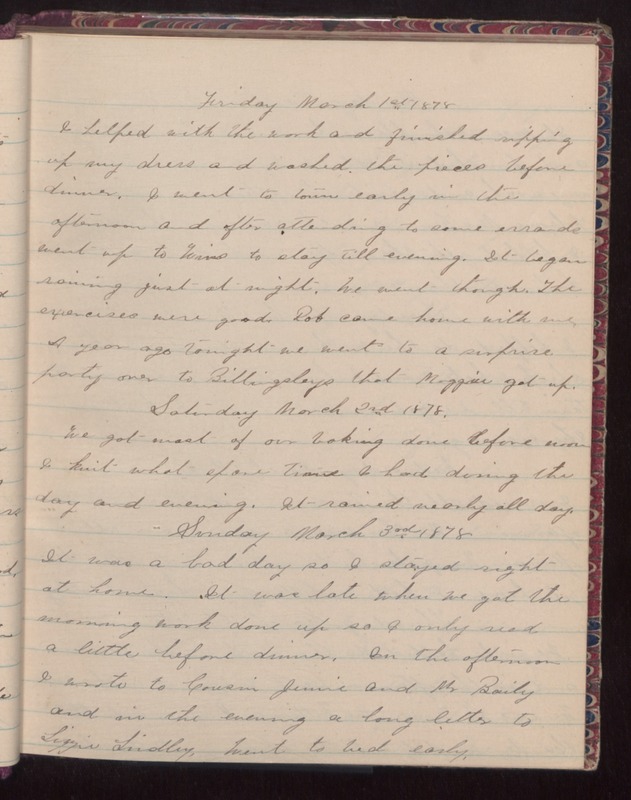 Friday March 1st 1878 I helped with the work and finished ripping up my dress and washed the pieces before dinner. I went to town early in the afternoon and after attending to some errands went up to Wins to stay till evening. It began raining just at night. We went though. The exercises were good. Rob came home with me. A year ago tonight we went to a surprise party over to Billingsleys that Maggie got up. Saturday March 2nd 1878 We got most of our baking done before noon. I knit what spare time I had during the day and evening. It rained nearly all day. Sunday March 3rd, 1878 It was a bad day so I stayed right at home. It was late when we got the morning work done up so I only read a little before dinner. In the afternoon I wrote to Cousin Jennie and Mr Baily and in the evening a long letter to Lizzie Lindley. Went to bed early.